You know what's more mind-blowing that latte art? Latte art drawn in vibrant color. And this Japanese coffee craftsman has mastered it. You are looking at the work of "Nowtoo Sugi". Starting this past February, Sugi began using colored bartender syrups to, as the hobby artist says, "paint" on coffee. Sugi isn't the only one to create colorful lattes, but is certainly one of the best. So, for example, Sugi uses Blue Hawaii syrup for, well, blue and strawberry syrup for red or pink. The colors are mixed with steamed milk for variation. Sugi's work features video game, anime, and movie characters from Japan and the West. The first, or one of the first, color coffees the artist did was of One Piece's Donquixote Doflamingo (below). Soon after that, the frothy painter followed up with Nintendo's Kirby character. And Sugi also does 3D latte art—that is, color 3D latte art. The Japanese latte artist says this as a hobby—a way to blow off steam, if you will. So, since Sugi does this at home, that means only friends and family get to sample this amazing looking coffee. But who could drink such amazing art? Sugi, thankfully, does share the work online Below, you can check out some videos, which show how these vibrant java works are bought to life. 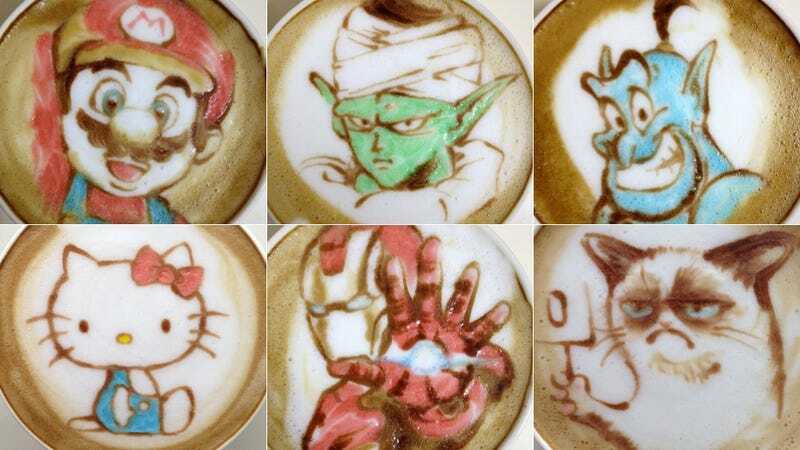 In case you missed it, here's a look at 3D latte art.